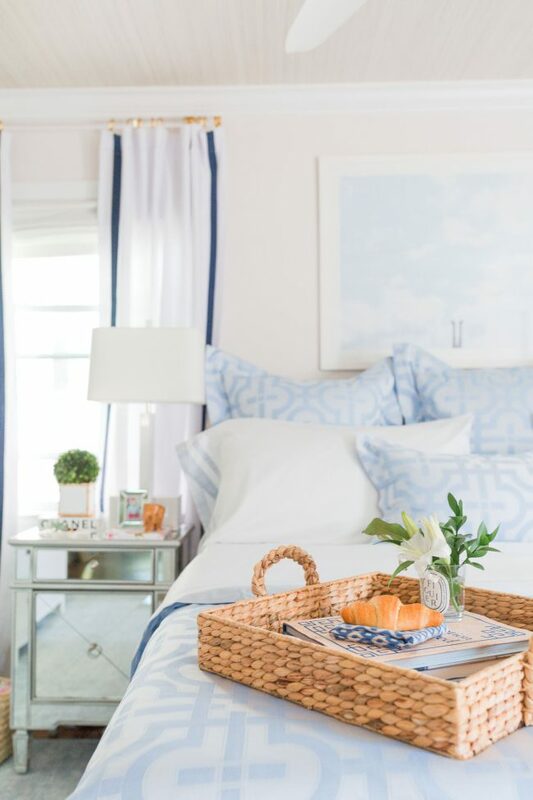 Welcome to our fifth installment of Room View, a series on Fresh American Style where we’re partnering up with some of our favorite design bloggers and challenging them to make over a room in their home with Annie Selke products! 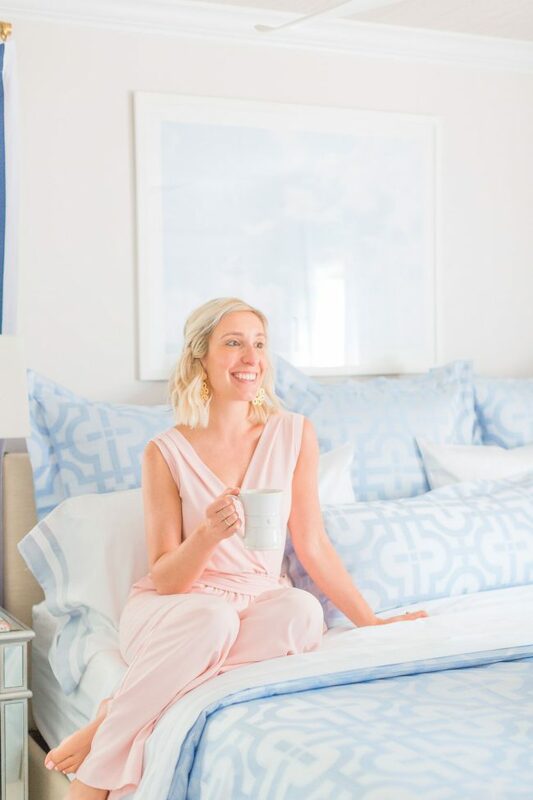 Last month we featured blogger Claire Brody and this month, we had the pleasure of working with Julia Dzafic, the writer behind the Connecticut lifestyle blog Lemon Stripes. 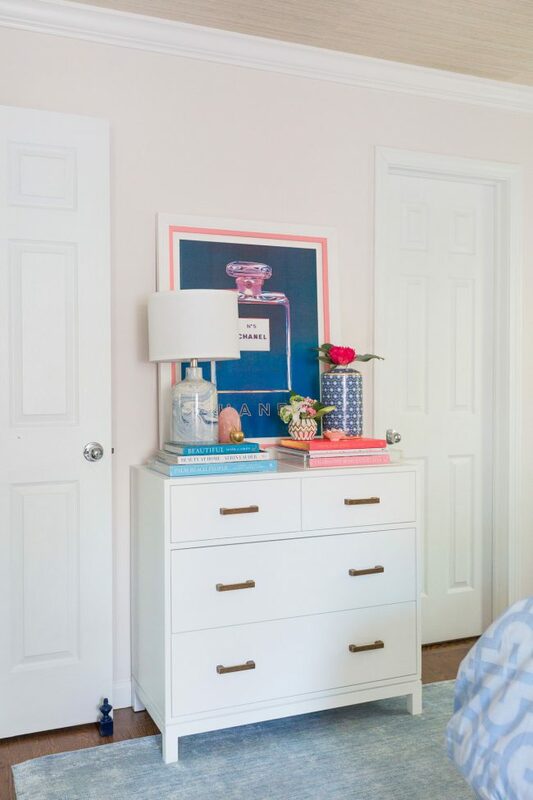 Julia wanted to redesign her master bedroom to be a more sophisticated, calming and cohesive space. 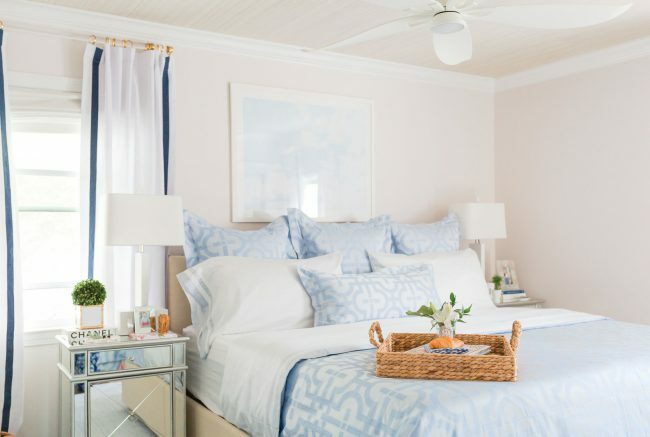 To help achieve this goal, she enlisted the help of Connecticut-based interior design firm Prudence Home & Design and sourced a bevvy of luxurious Annie Selke bedding and a plush Dash & Albert rug! Plus, head over to Julia’s Instagram to find out how you could win $300 to spend on any Annie Selke product(s) you want! 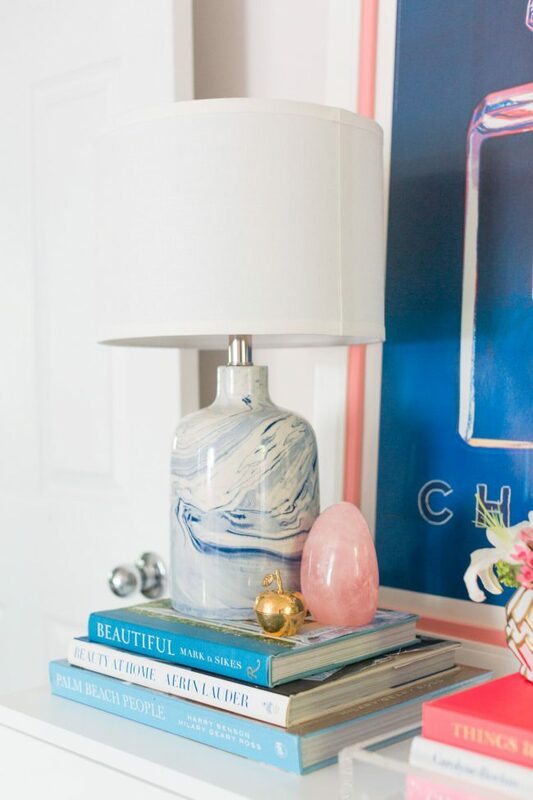 Scroll down for photos of the new space and the 411 on her design inspiration. Clean and preppy. 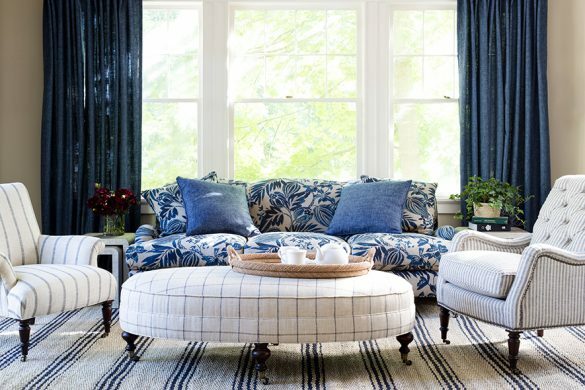 I love navy and white and have it prominently in every single room of my house. 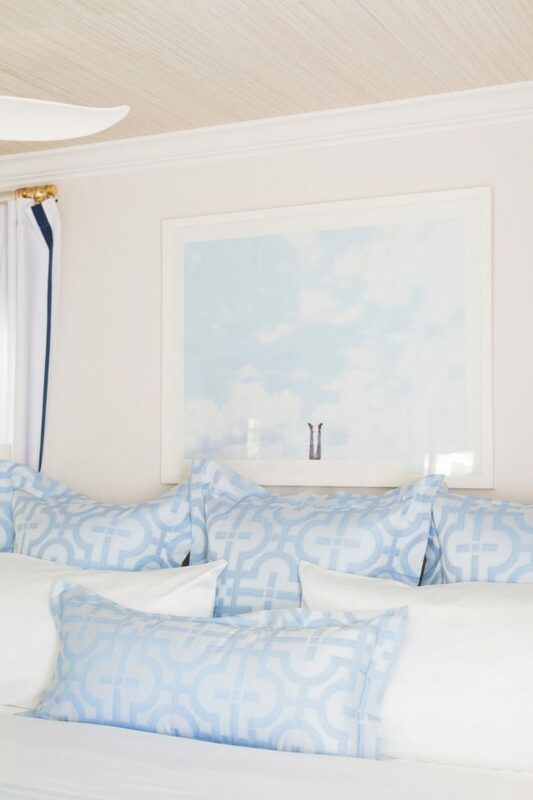 But the most important things to me with interior design is comfort and ease. 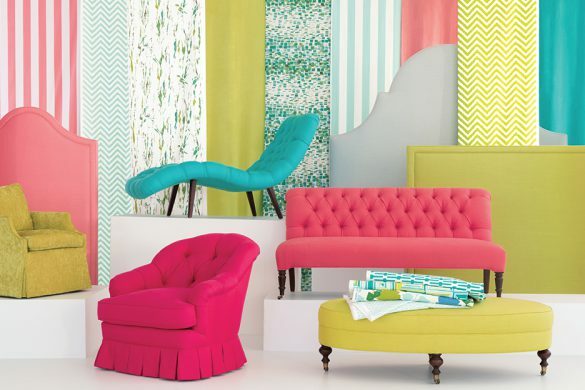 I don’t want a fussy house where people feel like they can’t sit on a couch or touch anything. 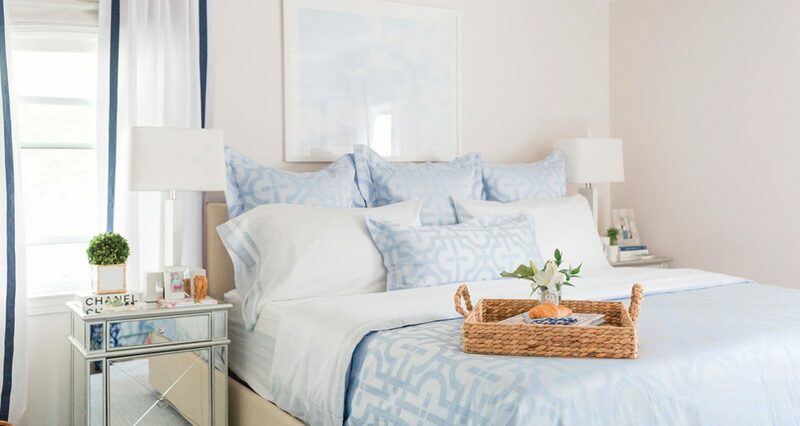 Why did you choose your master bedroom for the makeover? 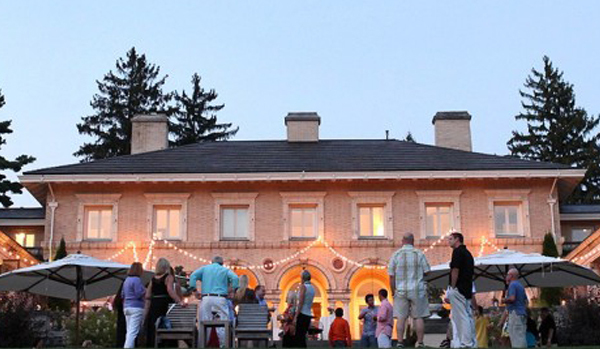 When we moved into our house three years ago, I had a designer make a plan for the master, and I was so frazzled with the move that I barely even looked at it or cared. I was just so over everything at that point! Since then, I’ve made little changes here and there but never really felt like that comfy cozy bedroom feel that you’re supposed to feel in your own room. 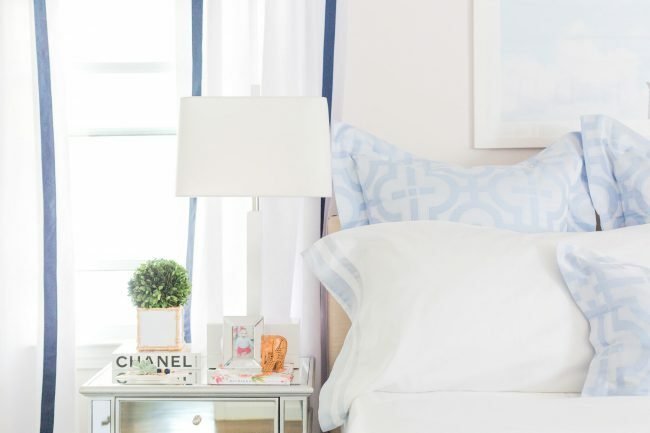 What was the goal for your bedroom design? 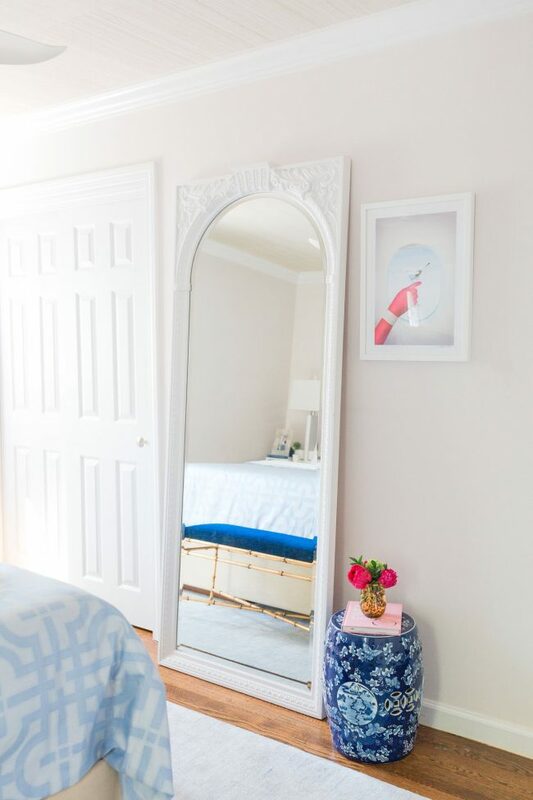 My main goal was to make our tiny bedroom look larger… Even with a king-sized bed. 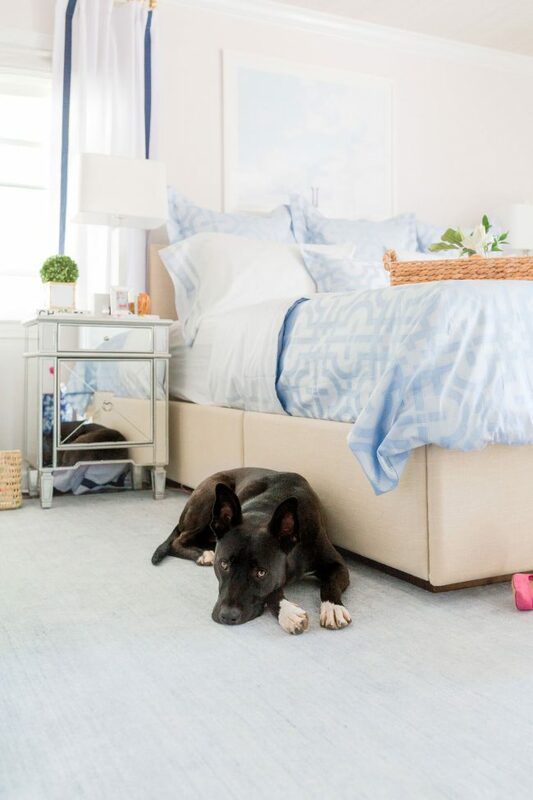 When we swapped out our old, busy rug for this beautiful sky blue one, it made an immediate difference. The grasscloth on the ceiling had the same effect which was a huge surprise to me. 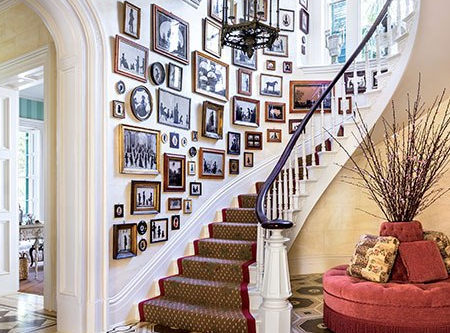 I never thought that wallpapering the ceiling could have that effect. 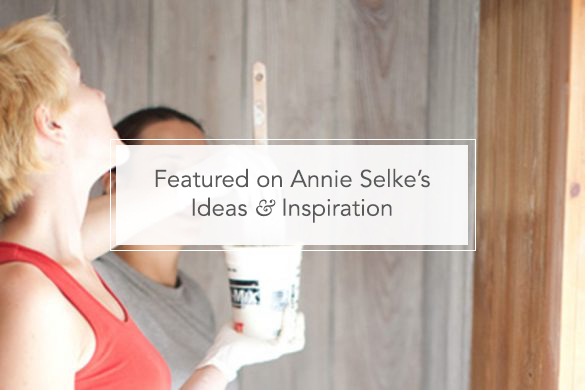 What do you love most about Annie Selke products? Do you have a favorite item? I love how beautiful they are but my favorite part is how easy they are. 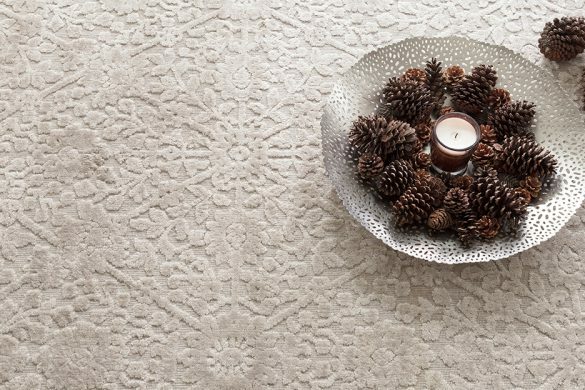 I have Dash & Albert rugs all over my house, and I never have to worry about them, even with a big dog and a baby who gets into everything. 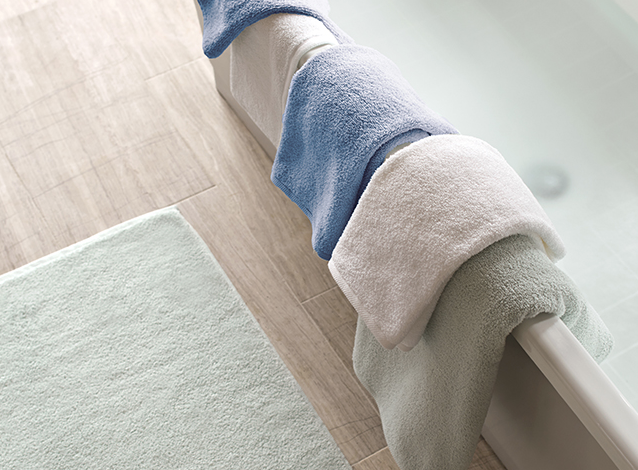 They’re easy to clean and never look old or ratty. 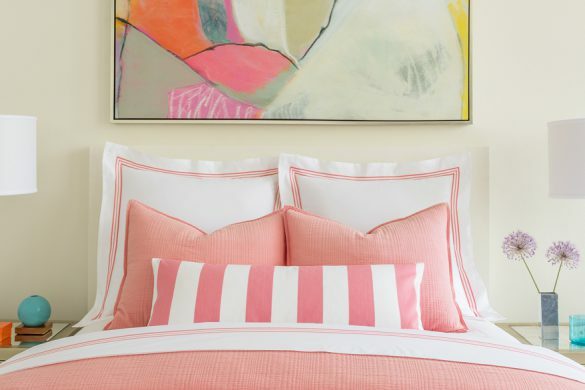 Now that I have Annie Selke bedding, I see what all the fuss is about! It’s so soft and luxurious. 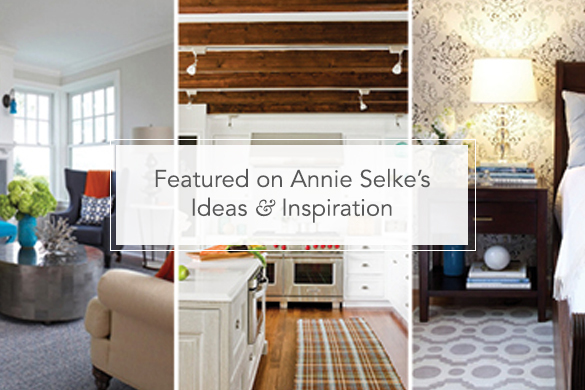 What is it about the Annie Selke brand and product designs that resonate with your personal style? 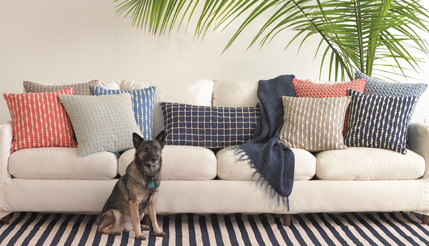 I love that there is a pet-friendly aspect to the rugs (I’m a giant dog person) and everything feels both playful, preppy, yet elevated. What is your favorite aspect of your newly designed room? The bedding for sure. I love how soft it is but how luxe it looks.